Some time ago I stumbled across an article with an intriguing title: “Finding and Analyzing Evil Cities on the Internet”. It was written by security analysts to investigate if it was possible to use IP addresses to not only identify the countries where malicious cyberattacks were originating but also to answer the question “are there cities that are relatively more evil than others?” In case you were wondering their analysis found the most “evil” city in the world was surprisingly Seoul, though when population was taken into account it proved to be the city of Chelyabinsk in Russia! For many Christians cities are inescapably associated with evil. Yet as the Psalmist reminds us the very dwelling place of the Most High is the City of our God. This issue of Vista deals with the topic of Urbanization in Europe. Yet rather than focus on a detailed analysis of the demographics we have given prominence to two theological treatments of the city. The first, by Ben Beckner calls for a missional theology of the city. 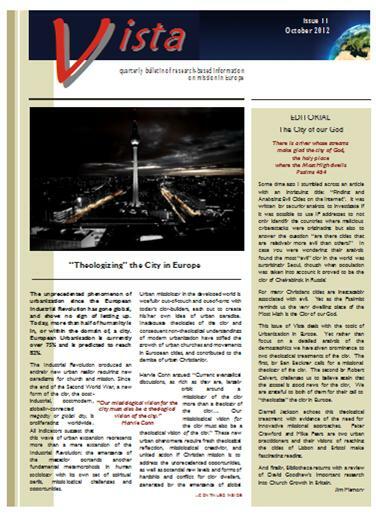 The second by Robert Calvert, challenges us to believe again that the gospel is good news for the city, We are grateful to both of them for their call to “theologize” the city in Europe. Darrell Jackson echoes this theological treatment with evidence of the need for innovative missional approaches. Peter Crawford and Mike Pears are two urban practitioners and their visions of reaching the cities of Lisbon and Bristol make fascinating reading. And finally, Bibliotheca returns with a review of David Goodhew’s important research into Church Growth in Britain.